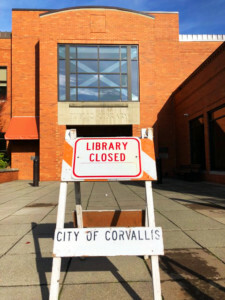 Summary: The Corvallis Library building will be closed for repairs Monday, February 4 – Friday, February 8. No items will be due during the closure. You can still pick up arrived holds from the back (north) parking lot from 10:00 AM to 5:30 PM each day we’re closed except Wednesday, February 6. All branches of the Corvallis-Benton County Public Library will be closed on February 6 for staff training — Corvallis, Philomath, Monroe and Alsea. The Bookmobile will follow its usual schedule all week, including Wednesday Feb 6. The Corvallis Library will be closed Monday, February 4 – Friday, February 8 for phase one of a major plumbing repair project. During this closure other annual maintenance tasks that impact public entrances into the Library will occur as well. We understand this is incredibly inconvenient and apologize for the long closure. Unfortunately this closure is necessary as restrooms will be out of service, no running water will be available, ADA access will be limited or inaccessible and many areas of the library will be closed due to construction work. No items are due during this time frame. We will still be accepting your items for return and the drive-through book drop in the parking garage will be available for your use during most times. Because we know it will be challenging to be without library services for a longer period of time, we are offering holds pickup during certain hours. Library staff will be available in the north parking lot near the stairs, and you can pick up any holds that are ready for you. This service will be offered throughout the week from 10:00AM-5:30PM, except for Wednesday, February 6. Additionally, we will take this opportunity to provide our staff with further professional development and training. All locations in the Corvallis-Benton County Public Library, including Philomath, Monroe and Alsea locations, will be closed on Wednesday, February 6. The bookmobile will continue its normal schedule throughout the week. Again, we thank you for your understanding and patience during the closure.